Hi friends. 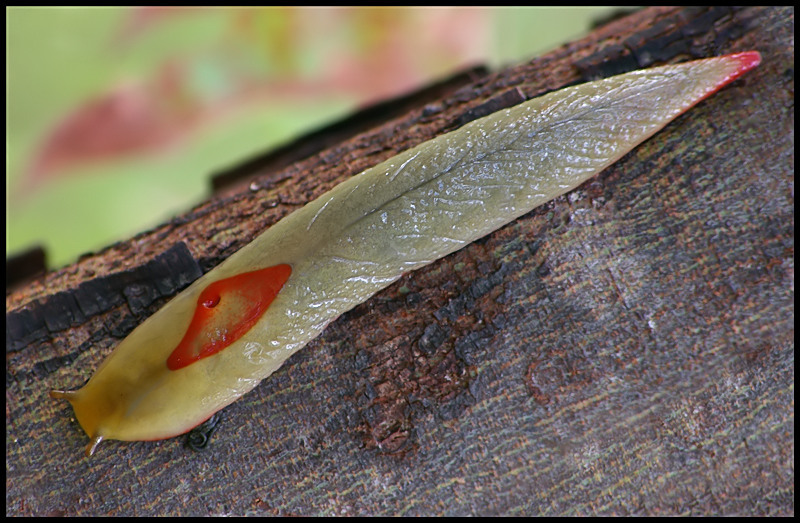 Today I present the Red Triangle Slug (Triboniophorus graeffei), an Australian native slug. This is Australia's largest native land slug and grows to a size of up to 14 cm (5.5 in). The distinctive red triangle on its back contains the breathing pore. Native slugs can be differentiated from introduced northern hemisphere slugs because they have only one pair of tentacles, while introduced snails and slugs have two pairs. Also, the saddle-shaped mantle seen in introduced snails is reduced or absent in native snails and slugs. The Red Triangle Slug is usually found grazing on microscopic algae growing on the surface of smooth-barked eucalypt trees, leaving behind scalloped tracks as it goes. They come in variety of colours from green to yellow, orange, red and even a rare white form. They are found through the woodlands and forests of south-eastern Queensland to Wollongong in central and New South Wales. Like my previous post, this one was taken hand-held at the Mogo Creek camping area in glumy conditions just before a thunderstorm. I don't know if you can call a Slug beautiful but it is certainly very special and interesting! Great focus showing sharp details of the amazing red markings and a well composed capture in fine colours. such an exotic slug, a wonderful sight. I'm sure I'd never seen an Australian slug before. You present it in sophisticated lighting. Slugs are tricky to photograph because the reflexions on the surface are constantly changing. Excellent job, Chris! What an amzing slug, looks really special, even beautiful in a way. Amazing also the red triangle with the little opening for breathing. The shot has been taken with fine light and good sharpness. A most interesting posting. What a great macro of this extremely beauiful and huge slug. Your pov is excellent, giving us very good details, especially its characteristic Red triangle sturcture of the species. It seems a good meal for perdators:). TFS this beauty my friend. Here is also rainy and cold (i think 14oC). Hello Chris, i could not think that a slug has such lovely colours till this posting. Great close-up and very informative notes on its biology. TFS. A great capture of a remarkable-looking animal! This Red Triangle Slug is well presented in this shot that makes great use of the ambient light. The POV, technical features and the composition are excellent. very good composition with good DOF,POV..
Hello Chris, superb close-up shot of this colourful slug with nice POV, details and composition. Very good capture of this interesting looking Slug; good POV and composition, sharp details and bright natural colours. Wonderful close up shot of this beautifully coloured slug on a trunk with nice bark texture. Very neat and sharp image with lovely colours and great details. Very nice composition. realmente original, texturas y compo. Very nice picture of this Red Triangle Slug. Excellent composition. Very good DOF and sharpness. Great colours. good close up shot of this Red Triangle Slug. Razor sharpness and very good of details. precious image of this slug,beautiful composition. It is the handsomest slug I have ever seen, Chris. Those red beauty spots on the back and the tail do it. The picture is harp and well composed. The tree trunk provides the most natural BG. I don't like slugs, because sometimes they eat my orchids !!! Lovely detail and colours,nice composition. I like the diagonal comp and complimentary colors of the BG here, nice. Very good color, exposure, textures, and details.. I wonder why they call this the Red Triangle Slug? Excellent capture of this one. Good diag compo,plenty of clear detail.